ForeverFit is an evidence-based approach that helps individuals conduct healthy lifestyle behaviors that stick! Whether you desire to exercise more, eat less or prevent and manage disease, ForeverFit will provide you with the resources and tools necessary to achieve and sustain your goals. Check back for a new session later this spring! A 90 day science based program to change body composition, teach exercise correctly, and strengthen the willpower to succeed in improving health & wellness. A science based program to change body composition, teach exercise correctly, and strengthen the willpower to succeed in improving health & wellness. Register now online or at the front desk. Investment on your ForeverFit lifestyle? Progressive exercise prescription with supportive educational handouts. These one-hour exercise sessions, conducted in groups of 4-6 people, will provide instruction on safe and effective fitness programming to help participants reach realistic health and fitness goals. 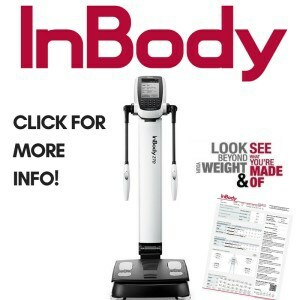 InBody assessments will provide an accurate and evidence-based way to monitor your progress. You will receive the same type of assessment at program start and end. Measure your fat, muscle, and water levels in less than a minute. No dunking. No pinching. No discomfort. Simply stand on the device and hold the hand electrodes to test. Positive social support will play an important role in your ability to conduct and sustain healthy behaviors. Over the life of the program, you will receive support on-line and in person in the form of motivational messages, information, tools and resources. Both in-person and on-line meetings, chats and videos will be offered to ensure that you are never out of touch. This is a general registration- teams, training days and trainers will be determined ongoing. Current program in session. Email us at [email protected] with any questions!